I just got this great torch butane lighter from Fogo. This is a really great torch lighter. It has a really great adjustable flame on it. It makes lighting things so easy. I love that the flame is adjustable so I can make it higher or lower depending on what I’m using it for. It’s a small design so it’s really easy to use. It’s easy to load the butane into the torch. Simply push the button on the pack and hold to activate the torch which is easy and simple. I also love that the flame is not effected by the wind. We used this during forth of July out doors to light things like punks and sparklers that you need a light for a period to get it started. The wind kept blowing out our lighters but this worked great and the wind didn’t effect it at all. I also use it for cooking all the time so I can apply fire to different things. It’s very versatile and easy to use. HUGE Butane Tank * Powerful Torch Melts Many Metals * 45° Angled Neck * Comes with a Removable Stand * Stay-on Switch for Hands-Free Use * Refillable with standard butane bottle This large torch lighter is a high quality item. It produces a reliable torch flame and once ignited, you can use the flame lock to keep the flame lit hands-free. 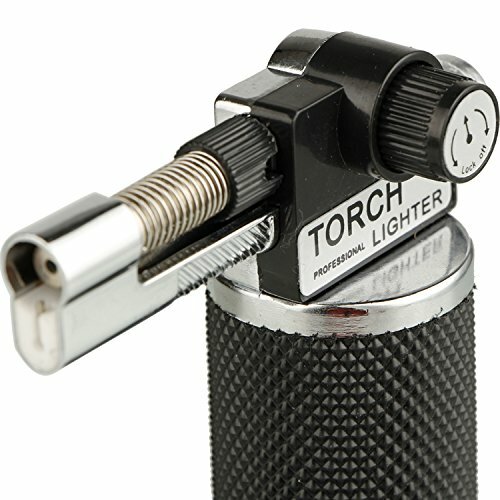 This torch lighter can be used to make creme brulee and it can also be used as a cigar lighter. It can also be used for: * Light Welding and Brazing * Plumbing Repairs * Soldering * Jewelry Making * Hobbies & Crafts * Model Making * More.. It’s 4.2 ounces and ~6in x 4in x 1in (LxWxH).